This is a two-page missing words worksheet. 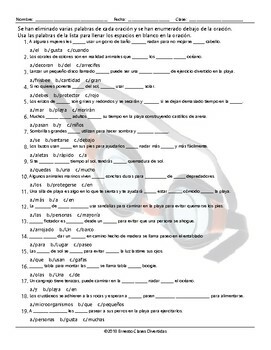 Each worksheet has a total of thirty-five sentences with three missing words. Students are given sentences in which three words have been removed. The removed words are listed below each sentence. Students will use the listed words to fill in the blanks in the sentences. Save on printing costs by projecting the worksheet and having students write down the answers in their notebooks.